Israeli soldiers scour the Hebron Hills for the killer of a 39-year-old mother of six in Otniel. 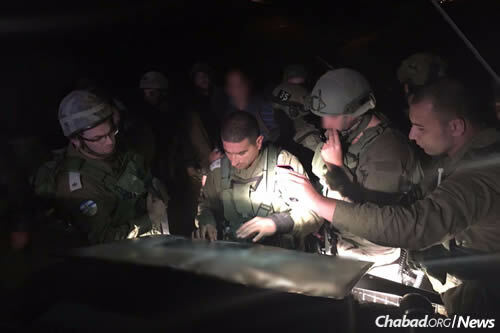 Israeli security forces were searching the area around the town of Otniel in the Hebron Hills after a local worker stabbed to death a mother of six in her home. The victim, 39-year-old Dafna Meir, who worked as a nurse and a premarital counselor, confronted her attacker at the entrance to her home soon after sundown on Sunday. According to Channel 2 news in Israel, her husbandNatan was not at home at the time of the attack; in his stead, three of her four children tried to help her fight off the attacker. After the terrorist fled, Meir’s 15-year-old daughter notified police and gave them his description. First responders from the Magen Dovid Adom emergency medical service found Meir unconscious and without a pulse; she was soon pronounced dead at the scene. A video of the terrorist, who police say is a local laborer, was taken by security cameras as he was fleeing the town of about 130 families. An intense search is currently underway in Arab villages near the attack. The victim was remembered as a joyful person by her neighbors. Meir worked at Beersheva’s Soroka Medical Center and a premarital counselor for brides. She and her husband are the biological parents of four children, and foster parents to two others. She was the 29th Israeli to die in a wave of terrorist attacks that began in October. The attack came just minutes after another stabbing was prevented in nearby Kiryat Arba. In that incident, a female terrorist was apprehended with a knife in her handbag before she was able to inflict any wounds. Dafna Meir will be laid to rest on Monday morning at 11 a.m. at Har HaMenuchot cemetery in Jerusalem. The procession will begin at 9 a.m. in Otniel.